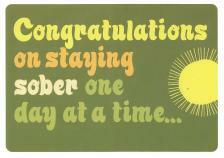 Front: CONGRATULATIONS ON STAYING SOBER ONE DAY AT A TIME... Inside Message: 365 DAYS IN A ROW! Your choice of "HAPPY BIRTHDAY!" or "HAPPY ANNIVERSARY!" Use the drop-down menu on the shopping cart screen to choose a birthday or anniversary message for the inside of the sobriety card.